Microsoft is still toiling away at its R&D laboratory building a Surface device small enough to fit inside your pocket, according to Vice President Panos Panay. The Surface Chief says the pocketable gadget is "absolutely my baby" and that development of the long-rumoured device is still ongoing. Rumours of a Surface Phone are nothing new. In fact, Microsoft has been mooted to be building a flagship smartphone with an industrial design similar to the Surface Pro since early 2013. But despite a flurry of leaks and cryptic hints from Microsoft executives, nothing has ever materialised. However, Surface Chief Panos Panay has confirmed the project is still alive and well. Panay also alluded to the existence of Surface devices in a slew of other form factors outside of the ones already available from the company. Speaking to The Verge, he added: “I think any other form factor you haven’t seen yet we’ve gotta get right, we’ve got to make sure we keep inventing to make it perfect. “I’m not talking about just the hardware, I’m talking about the whole thing. The pocket-sized Surface is codenamed Andromeda and is widely-tipped to ship with two touchscreens in a clamshell-like design. The Surface will purportedly fold-out to create a larger (ahem) surface for enterprise users who rely on productivity apps like Microsoft Office. 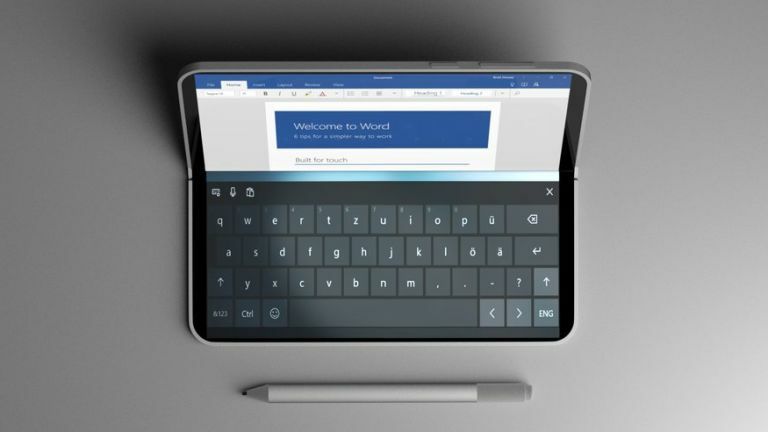 According to those with knowledge of Microsoft's plans, Andromeda is designed to blur the lines between what is traditionally considered PC and mobile. Microsoft VP Panos Panay has previously described the long-rumoured device as "like a Moleskine"
The as-yet unannounced product will ship with a stylus, similar to the Surface Pen available for the Surface Pro, Surface Laptop and Surface Studio range. Microsoft VP Panos Panay has previously branded the device "awesome" and described it fitting into people's workflows "like a Moleskine". Microsoft is not the only company experimenting with folding smartphones, with Huawei, Samsung, Apple and more reported to be hard at work developing their own foldable hardware. Given the recent uptake of hybrid tablet/laptop devices, it seems like a good time for Microsoft to get in on the action with its Surface brand – especially with a new product category, which would leave its rivals playing catch up. Quite frankly, this latest packet of leaked information has only whetted T3.com's appetite more for a pocketable folding device, so the sooner Andromeda is officially announced the better, either alongside the Samsung Galaxy X in 2019, or earlier.